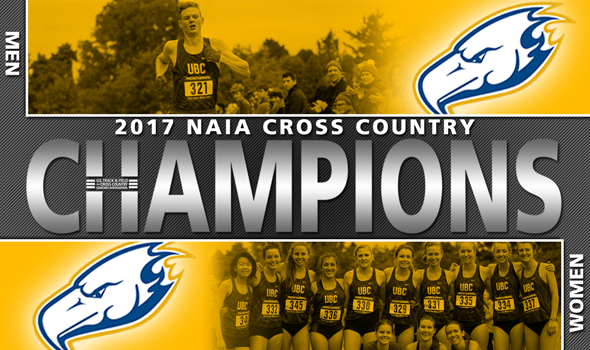 British Columbia swept the team titles at the 2017 NAIA Cross Country Championships this past weekend in Vancouver, Washington. The Thunderbird men were ranked No. 1 in the final National Coaches’ Poll of the regular season, while the women were billed No. 2. See below for the recap, courtesy of the NAIA Communications Department. Vancouver, Wash. – (Individual Results | Team Results) British Columbia won its first-ever national title Saturday at the 2017 NAIA Men’s Cross Country National Championships. The event took place at the Fort Vancouver National Historic Site. The Thunderbirds accumulated 41 total points, which is the best team total since Life (Ga.) tallied 41 points at the 1998 national championships. All five of British Columbia’s scoring individuals finished among the top 15, including top-five finishers Kieran Lamb and John Gay. Lamb, who finished 26th at the 2016 national championships, took third place with a time of 24:27, while Gay finished fourth in 24:41 – one spot better than his 2016 result. Overall, the Thunderbirds ran a combined 8-kilometer time of 2:04:17 – an average of 24:52 per runner. This year’s individual title when to Mark Shaw of Oklahoma City, who crossed the finish line in a time of 24:09. Shaw led for a majority of the race en route to becoming the first-ever individual champion for the Stars. The sophomore from Middlesbrough, England, was competing in the race for the first time. William Carey’s (Miss.) Geoffrey Kipchumba finished second for the second-straight season. The senior, who is now a four-time cross country All-American, ran the 8k course in a time of 24:19. In four trips to the national championships, Kipchumba never finished worse than 10th-place. Columbia (Mo.) took second in the team race with 168 points. The Cougars were led by Tommy Skosky, who earned All-America honors with a 17th-place finish (25:16). Oklahoma City took third-place with 179 points, while Southern Oregon (193 points) claimed fourth and Lewis-Clark State (Idaho) (200 points) finished fifth.